A shocking revelation from starting to bake bread from scratch at home is that I'm constantly looking forward to trying out new types of toast recipes. After a day or two, it's easier to cut larger slices of bread for open faced sandwiches or toasts, frequently finding their place in the lunch and dinner rotation. This recipe is a perfect savory toast recipe for a light lunch, and is relatively easy to bring together for a satisfying meal. Preheat the oven to 500 degrees Fahrenheit. Rinse the baby broccoli, trim and discard half of the stalks. Toss with 1 tsp of olive oil and liberally season with salt and pepper. Transfer to a parchment lined rimmed baking sheet and roast for 8-10 minutes, flipping the pieces halfway through. Remove from the oven to cool slightly and slice into smaller pieces if desired. While the broccoli is roasting, prepare the infused olive oil. Gently warm 3 Tbsp of olive oil over low heat, adding in the smashed garlic clove, 1 tsp of honey and 1/4 tsp of Korean hot pepper flakes. Swirl the pan occasionally for 10 minutes and then strain the mixture with a fine mesh strainer and allow to cool slightly. Prepare the ricotta mixture by seasoning the 1/2 cup of ricotta with a pinch of the Korean hot pepper flakes and salt and pepper to taste. Add 1 tsp of the infused oil to the mixture, mix together and set aside. Begin assembling the toasts by brushing the bread with the infused olive oil and toasting the bread to the desired crispiness level. 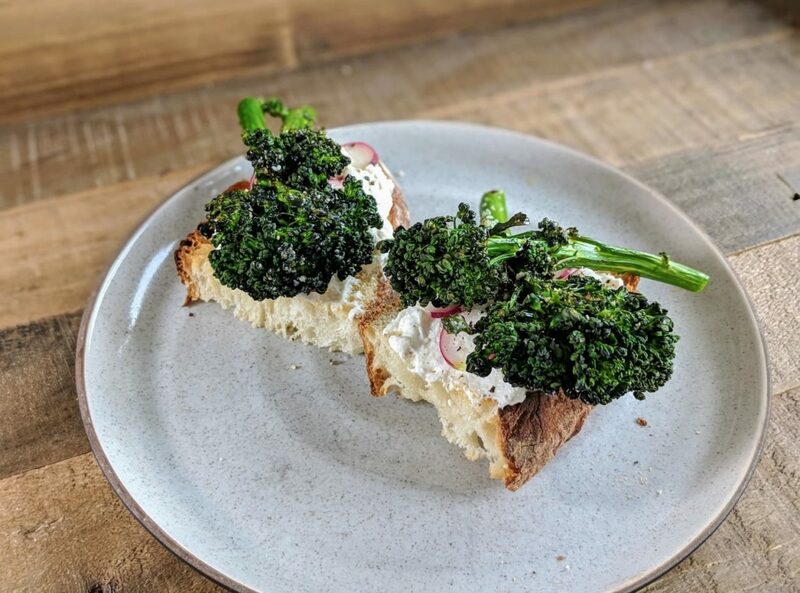 Add a generous portion of ricotta to each toast, top with the sliced radishes and baby broccoli and then drizzle with the infused olive oil. Serve immediately.